From recreating Internet memes and forgiving parking fines for food donations to driving students to class on their first day back from winter break, UF President Kent Fuchs has embraced social media to better connect with students, faculty and staff. Guiding his efforts—as well as many others’ throughout the university—is UF Social, a team comprised of Todd Sanders, director of Digital Communications and Social Media; Ryan Morejon, social media specialist; and Robbie Smith, multimedia specialist, who are all part of University Relations. The trio has one all-encompassing mission—to give a human voice to the UF brand—and it achieves this on social platforms Facebook, Twitter, Instagram and Snapchat in a variety of ways. At the heart of humanizing a brand is understanding that social platforms create countless opportunities for two-way communication and connection. 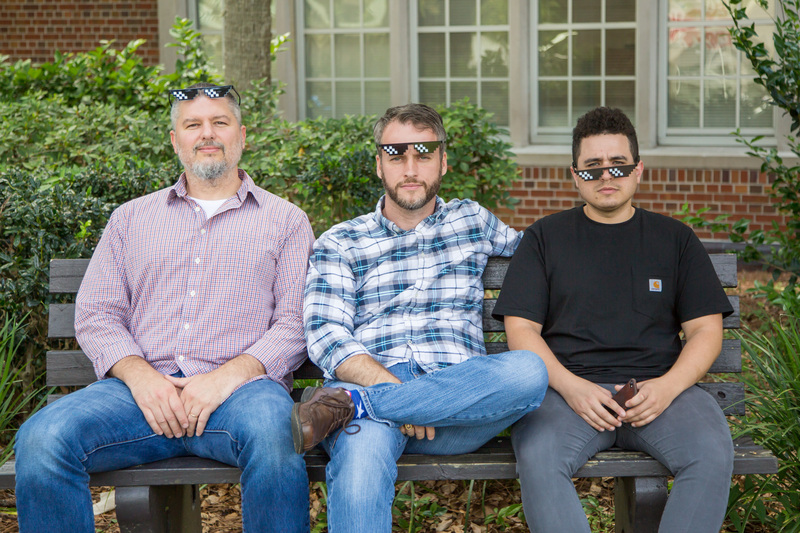 As Sanders, Morejon and Smith write, draw, shoot, design and share UF social content, they are constantly looking for new, interesting and personal ways to reach their audience of students and alumni. For example, for college admissions season earlier this year, Smith created 22 gif (image file) stickers for Instagram, and Morejon made animated gifs for #UF22 (the hashtag that newly accepted students used on Instagram and Twitter). In the days and weeks leading up to Feb. 9—the day UF’s decisions came out—the gifs were shared as a way to engage with prospective Gators. “On the day students got in, it was all hands on deck,” said Smith. He—along with Sanders, Morejon and UF Social’s interns—replied with personalized messages to all of the students who posted about getting into UF, connecting the students to UF long before they will arrive this fall. When Sanders was hired in 2014, the university’s goal of becoming a top-10 public university was underway. With a clear goal and preeminence funding, UF was in the right place to make it happen, said Sanders. By 2017, it had become reality, with UF landing at No. 9 on the U.S. News & World Report rankings of the best public universities. “President Fuchs is a huge part of that,” said Sanders. “Every success we’ve had is related in one way or another to him. Moving social forward requires someone at the top embracing and understanding it.” Fuchs, who writes his own Tweets and manages his own account, does exactly that. As recently as four years ago, UF’s social strategy revolved around sharing events and press releases and presented a more formal, official “UF voice.” Now, UF’s voice reflects its audience’s, said Morejon. UF’s social audience drives the content and conversation. The team loves sharing students’ stories and building connections. As you might imagine, the work of UF Social is not an 8-to-5, Monday-through-Friday job. The numbers prove that the team’s strategy is working. Though UF Social relies on real-time monitoring of content to gauge engagement (as opposed to comparisons or trends over time), its platforms have gained more and more followers over the years. In 2014, UF had 20,000 followers on Instagram, for example; today it has 122,000. As of last month, UF reached 100 million gif views on Giphy—a platform for finding and sharing gifs. Of course, engagement sometimes takes the form of crisis communication. Last fall, instead of recording a video message from his office, Fuchs spoke to the campus community from the Plaza of the Americas on the day of white supremacist Richard Spencer’s speech. With the time, energy and urgency required of their work, Sanders, Morejon and Smith say that maintaining a sense of fun and levity is critical. “We want to make people smile,” Morejon said. “Think and smile,” added Sanders. To learn more about UF Social and its summer events, follow @UFsocial on Twitter or visit them here.